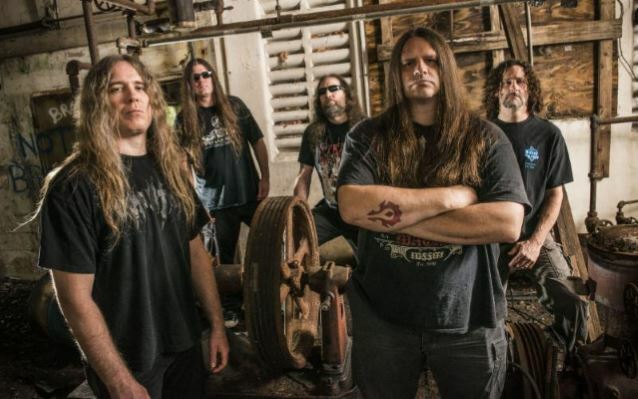 Josh Rundquist of That Drummer Guy recently conducted an interview with drummer Paul Mazurkiewicz of brutal death metal veterans CANNIBAL CORPSE. You can listen to the entire chat below. A few excerpts follow (transcribed by BLABBERMOUTH.NET). Paul: "It's been the same as it's always been. We finished the touring and we start concentrating on the writing and all that. But, having three main songwriters in the band, Alex [Webster, bass], Pat [O'Brien, guitar] and Rob [Barrett, guitar], that, of course, helps. We're not having to rely on one guy, basically. But yeah, those guys pretty much work individually these days. Of course, I'm the common denominator. I'll get with [them] basically. But that's it. We have a timeframe to create and we start plugging away and start coming up with ideas, and like I said, it's great to have three solid songwriters that we can disperse the songwriting out amongst everybody here and not have to rely on one guy. But, yeah, that was it. Just plugging away. Once the touring stopped about a year ago it was, and there you go." Paul: "We feel that we're always trying to get better as we go as musicians and songwriters, as players. So yeah, this time around for some reason or another, those guys came up with some really catchy, great riffs, very aggressive. We really worked hard to hone the songs down to make them as best as possible. Yeah, [first single/video] 'Code Of The Slashers' is really a great example of that. I think it's a killer, it turned out awesome and it's a little bit different than we've done maybe in a while, but nothing wrong with that. 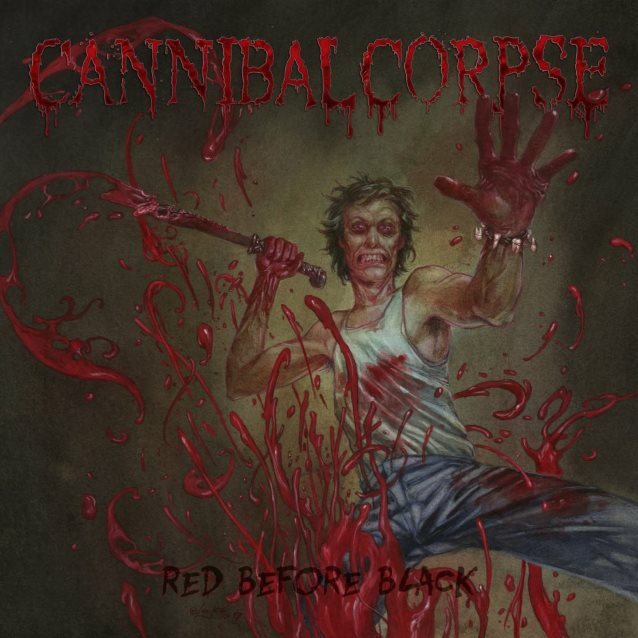 I think on this album, the way I look at it, is we got a culmination of the best of CANNIBAL CORPSE, the best of what we've had to offer throughout our whole career and here we go. We got it here with 'Red Before Black'." Paul: "I wanted to outdo myself on this record [compared to the] last record. I made even more of an effort myself to push harder and just to be the best I can be and to make these songs the best they can be. So, yeah, I just, like I said, just put in extra time, just did little things to work on my stamina and all that kind of stuff. Just try to absorb the songs, maybe even more if I can and listen to them a lot more just to try to figure out if there's anything else that needs to be done in any capacity. We took it to another level. I think life's too short. How many opportunities you got here? Our mentality is getting more so, that the older you get, you never know how long we have, there's no end in sight at this point, but you never know. I really am more focused than I ever have been in that way of just wanting to do the utmost best I can do and work the hardest I can and work the hardest I ever have worked. That's what we did for 'Red Before Black' and that's what I did. I feel it's apparent again in my drumming when you listen and hear what I'm doing. You're going to notice those things." Paul: "You should be happy with your new stuff. Obviously, everyone always says that cliché and all that, but really, we always are trying to look forward and not look backwards, otherwise, right, if we go 'Oh my gosh! What do we do? We're just going through the motions. No one cares. I guess we better keep playing the old stuff. That's all everybody wants to hear.' That's not the case. We're constantly pushing forward and so much of our new material is turning into our classic material. And the old CANNIBAL is so far away in the past now that we don't have to just sit back and write or rest on an album or two kind of a thing. We want to move forward and show people like 'No, look. This is the best CANNIBAL here. The new CANNIBAL.' The fact we're so excited and want to play most of it or what have you, well, then that's a testament to where our mindset is and how we're feeling. But, truly, we do feel that this is the best material and we've been the best band we've been in the last ten years. I think we're creating the best material we've had on the last records. I prefer playing the new stuff then going backwards." Paul: "We're getting very excited for everyone to hear the rest of the record. It's the best CANNIBAL. We're really excited, really pumped for everybody to hear these songs. I think once it's out, everyone's going, yeah, I'm hoping, but I'm really confident we're all fairly confident that people are going to be freaking out on this record."